This is surprising as with large naked wings and the energy they expend in flight, bats are expected to have high rates of water loss by evaporation, say the scientists from the Ben-Gurion University in Israel. This may provide significant insight into how bats might respond to a future changing climate. The researchers are presenting their work at the Society for Experimental Biology Annual Conference in Prague on Wednesday 30th June 2010. 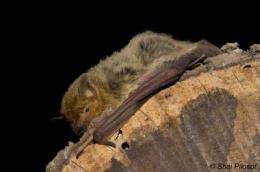 The researchers found total water loss in the desert-living Pipistrellus kuhli was just 80% of other non-desert species. Total water loss is made up of the sum of cutaneous (through the skin) and respiratory (exhaling) water losses, explained lead researcher Dr Munoz-Garcia. Desert bats were found to have reduced cutaneous water loss (CWL), the biggest contributor to total water loss, when compared to non-desert species of bats of the same size. The proposed mechanism of adjusting the lipid (fat) composition of their skin is known in other species of mammals and birds. Dr Munoz-Garcia and his team were the first to identify this link in other species of bat, and aim to prove it in desert bats. The scientists believe that these findings provide significant insight into how bats can adapt to major changes in their environment. "Control of energy expenditure and water loss is crucial for all terrestrial animals to survive and reproduce", explains lead researcher Agustí Munoz-Garcia. "This is particularly important for animals that live in deserts, where ambient temperatures are high, humidity is low and drinking water is scarce"
The next step for Dr Munoz-Garcia and his team is to examine further species of desert bats to consolidate their findings so far and shed more light on the adaptive mechanism for reducing CWL. "Our plan is to measure at least 8 species from different environments, so we can start building a database that can allow future comparisons", Dr Munoz-Garcia explained.